My Life with Pipidinko: Christmas Countdown Activities. Day 16. Baking cookies for a Pot Luck. Christmas Countdown Activities. Day 16. Baking cookies for a Pot Luck. Santino's preschool had a Christmas concert with Santa, gifts and potluck. Our contribution were Italian cookies, called "pizzelle". (I wrote about this recipe last year, find it here). We've baked cookies many times, but I think this activity is worth mentioning in our Countdown Activities list. Santino's favorite part is breaking the eggs in the bowl. Then we measure sugar, oil, and other ingredients, and Santino is eager to mix it all. 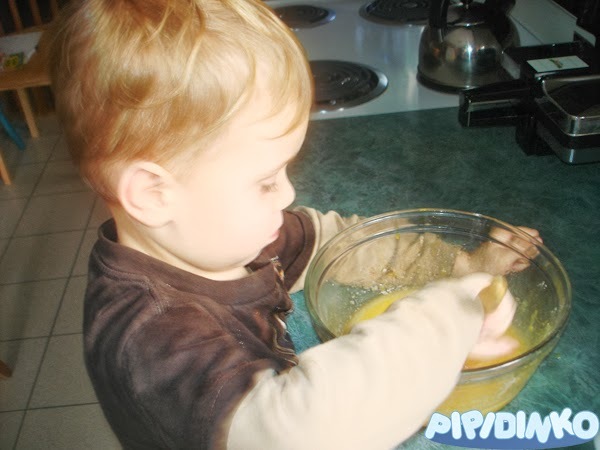 He is very careful, trying not to spill the dough. It takes him a while, but he does mix it quite well, I only have to finish it with a few strokes. He loves watching how all the ingredients blend together, lose their texture and disappear, becoming one substance. 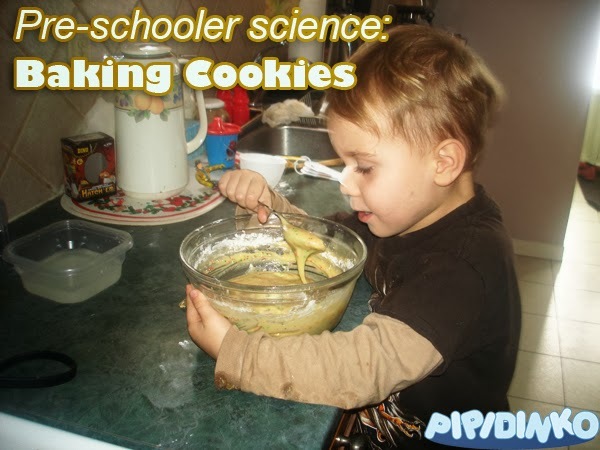 This time Santino decided to help with adding the ingredients, and added some baking soda (a lot of it) when I turned away. I didn't realize how much he added, until we baked the first 2 cookies, and couldn't eat them. They tasted terrible! I used this opportunity to explain, that too much of anything can turn out being bad. Always use a little bit, in moderation. After the first batch went in the garbage, we made another batch, and baked enough cookies to share and to have at home. 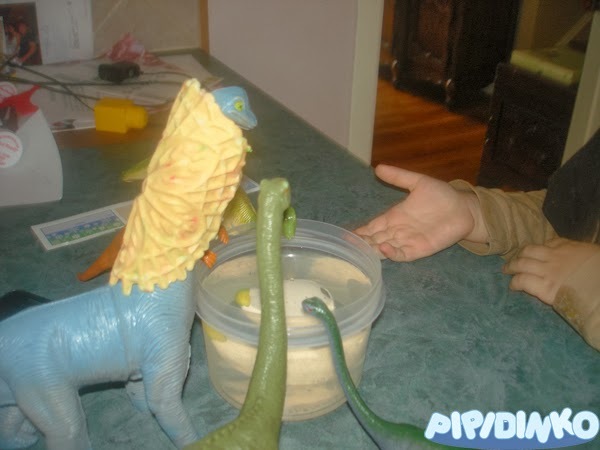 I rolled one of the pizelles in a tube and Santino gave it to one of his long-neck dinos to wear for a few minutes. Then he ate it.